ITV Wales Guest Blog – A Future for Welsh Coal? Here’s a piece I wrote for ITV Wales – exploring whether Welsh coal has much of a future. Wales has had a long and complex relationship with coal. Today there’s little trace of the industry that at one time employed tens of thousands of men. But while the cheapness of imported coal provided a reason for scaling down the industry in the 80s and early 90s there’s still a market for the kind of coal produced in South Wales. For a start it’s generally of a very high quality. 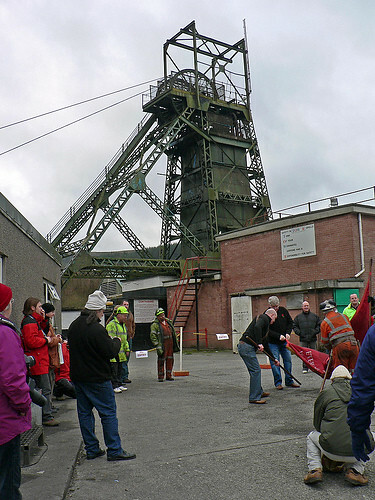 Tower Colliery managed to remain profitable after being bought out by its workforce in 1994 closing only after it practically exhausted the coal it could mine in 2008. One success story is Aberpergwm Colliery, situated near Glynneath. Originally closed by the National Coal Board in 1985 it was reopened by a private company a decade later. Now, the mine is set for a major development that could secure its future. It’s benefited from taking on some of the workforce and machinery from Tower, as well as training a small number of apprentices. David Jan, a spokesman for Western Coal, says that it’s too early to go into specifics but that plans could be finalised as early as March this year. Nonetheless, the company recently received planning permissionto double the size of its surface operation, with an aim to produce a million tonnes of coal annually. Aberpergwm isn’t the only site that shows promise. For decades, there’s been talk of developing a mine to exploit the large coal reserves in the Margam area. Recently, it’s taken a step closer to becoming a reality. The steel firm Corus owns a licence for the coal in the area, and recently announced that it’d look at the feasibility of developing a mine to directly fuel the Port Talbot steelworks. In spite of this it’s hard to see much scope for a resurgence of the industry on a wider scale. Many old sites would be near impossible to reopen safely and economically. There are other factors too, like cultivating a new workforce to replace that of previous generations. On a more fundamental note there’s little escaping the fact that burning coal damages the environment. Although the consequences of releasing carbon dioxide into the atmosphere are acknowledged worldwide, the technology to deal with it remains in its infancy. Much of the UK’s power is generated from coal, a situation that will be the case for the near-to-mid future at least. Governments are going to have to reconcile this with the importance of cutting CO2 emissions in coming years. Carbon capture and storage (often abbreviated to CCS) offers some hope. It’s a complex technology, but provides a means of collected gas released by power stations and compressing it before burying it underground. The trouble is it doesn’t yet exist on a wide enough scale. There are operational schemes around the world, generally pumping the waste gas into depleted oil fields undersea, but very few on an industrial scale. But progress is being made. The Longannet power station in Scotland is the site of the UK’s first CCS test plant. It’s the last remaining bidder in a Government competition to fund a full-scale demonstration of the technology, which would cut its CO2 emissions by over a million tonnes a year. And Wales looks set to play a part, too. The Seren Project began in 2010, led by Cardiff University’s Geoenvironmental Research Centre. It’s working to develop what it calls “geo-energy technologies” to the level at which they can be put into practice commercially. The Project’s Director, Dr Rob Francis, argues that Wales’ abundant coal reserves can be put to great use. For a start, Seren is researching how effectively CCS can be put into practice in Wales, using laboratory tests to work out the logistics of burying liquid CO2 into coal seams instead. Dr Francis said: “If we can find a solution here in Wales, it’s very much a better option. The carbon, because it binds to the coal, is more likely to stay there. “It’s a question of getting samples from way down and knowing exactly the coal we’re dealing with. If it could be proven to work, the gas would be buried in the coal fields that lie undersea and couldn’t be mined anyway. Francis suggests that setting up a system would make Wales more attractive to business and industry. Coal will be used to meet Britain’s energy needs for years to come. But it’s going to be hard reconciling this with environmental commitments, not to mention making best use of the country’s resources. A high level of innovation – and investment – will be crucial.